Just as I mentioned in my earlier post Life And Death, the walls of East Village buildings change quickly, and without a moment's notice! 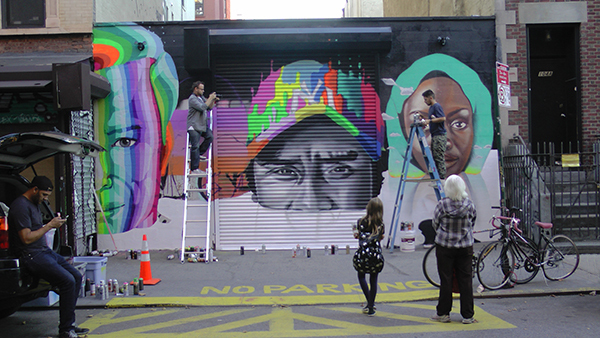 The painting of new murals always draw a crowd of enthusiastic spectators — you can even see another East Village photographer atop the ladder on the left, documenting the event! I don't remember what the wall looked like before, but an old-timer behind me said "It's much better now. No graffiti." Eradicating graffiti, one wall at a time… in the East Village Today!